Last week, Bassel’s wife and closest family members announced his death was officially confirmed by the Assad regime. For me and his other friends this was extremely sad to hear, although after two years without any news about or from him, the chances he was still alive were minimal. I first met Bassel Khartabil Safadi during my work for the Hivos Media and Culture programme at the Arab Bloggers Meeting in December 2009. This legendary meeting in Beirut – attended by over 60 Arab bloggers – was organised by Hivos partner Global Voices Online, amongst others. Participants shared experiences, contacts and knowledge. There was a lot going on, the spirits were high and full of hope. However, no one expected that one year later the Arab uprisings would start taking off, partly created by campaigns on Facebook and Twitter. Tunisian president Ben Ali was the first to leave after one month of protests. Sadly, the protests had dramatic consequences for most countries in the region – with the current situation in Syria as a tragic low point. 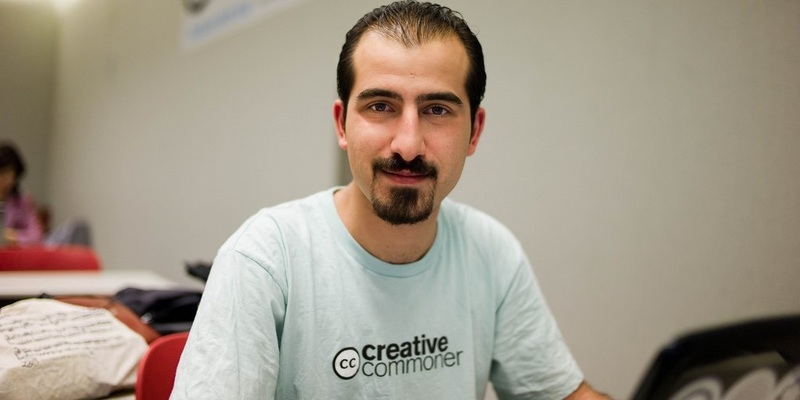 Bassel was an internet activist, software programmer and entrepreneur. He operated cleverly like a spider in the web before the uprising in Syria started. His thinking was all around freedom of expression, open access and open source. We started discussing the coworking space Aikilab that he founded, and the next week I visited this office space in Damascus. Bassel was not only a very smart ‘geek’, but also diplomatic and knew his way around the many restrictions in a closed society like Syria. A few months, later Aikilab became a Hivos partner and Hivos funded their office materials and rental. After the start of the Syrian Revolution on 15 March 2011, Bassel and I did not meet again in person but kept in touch through e-mail and online chats. When I told him about the idea of writing down his story, Bassel immediately agreed. We tried to arrange to meet for an interview in Beirut, but did not manage due to security reasons. Bassel was arrested on 15 March 2012 – exactly one year after the revolution started. I started interviewing Bassel’s friends in Beirut, Paris and London to reconstruct his ‘year of the revolution’. I spoke with his family, journalist friends and colleagues from other human rights organisations. A Lebanese tech friend collected Bassel’s Facebook posts and tweets in a safe database so they could be used for the publication. I entered into a partnership with publisher Fosfor thanks to a grant from the Dutch Fonds voor Bijzondere Journalistieke Projecten, a fund for special journalistic projects. I finished his story and smuggled the text into Adra prison through Bassel’s wife Noura. Bassel read and added to the text, which Noura managed to smuggle out again. On 3 October 2015, Bassel was moved from Adra to an unknown location. It was only on 1 August 2017, almost two years later, that Noura received the formal confirmation of his execution, a few days after his transfer from Adra prison. Thank you Bassel for all we learned from you, and for all you shared with me about Syria, Creative Commons, open source, entrepreneurship and most importantly, about trust and friendship.